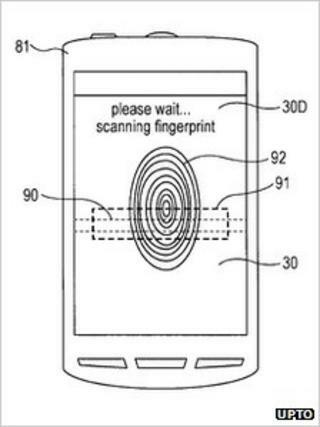 Technology to allow smartphones to scan their users' fingerprints through their screens as an identity check has been patented by Sony. It describes a range of ways to build "light-transmissive displays" to allow sensors to look out of the screens. The innovation has beensubmitted to the US Patent and Trademark Officeand was flagged up by the websiteUnwired View. It would not be the first time a smartphone has offered a fingerprint lock - Motorola Mobility launched the Atrix last year - a handset with a biometric scanner fitted to its back. However, Sony's application suggests that allowing the scan to be carried out via the front of the phone would simplify the process. "[It would] allow even a user who is not familiar with the fingerprint authentication to readily execute an input manipulation for the fingerprint authentication," the patent document says. To feel safe with the idea consumers may demand that their phone's security checks are more robust than a four-digit pin code. "Making transactions easy for consumers is something that is a goal for retailers and technology providers," Brian Blau, research director at Gartner told the BBC. "Having something like this that securely guarantees the users' identity can only be a good step forward." It adds that the move would also help to prevent the "uneasy feeling" created at present when users do not maintain "eye contact" because they are looking at each other images on their screens rather than directly into the phones' cameras. Applefiled for a patent four years agoto place a camera sensor in the centre of a computer screen so that users could naturally video conference with each other and take self-portrait pictures of themselves while looking at own their faces. It has yet to put the innovation to use.